A graduate of Camberwell College of Arts, Shadi Al-Atallah is a figurative mixed-media artist whose own queer, mixed-race identity is bodied forth in vigorous, complex work that engages boldly with non-normative identities, composite cultural affiliations, spirituality and mental health. Cob Gallery is proud to present Al-Atallah’s debut solo show, Roadblocks. Part of a wider series drawing on the theory of ‘catharsis’ in Aristotle’s Poetics – the first work of western literary criticism, and the text that set out the model on which all subsequent ideas of tragic drama have been formed – Al-Atallah’s large-scale paintings capture experiences of profound release and heightened, almost unbearable sensation. They revolve around the idea of catharsis as a radical working-through of emotion and of the self: a vital, healing process that restores spiritual equilibrium, but one whose psychological intensity verges on being physically painful. In this exhibition, these ideas are applied to the particular theme of ‘roadblocks’, considered in both a literal sense and a figurative one: as bottlenecks of emotive force coagulating and compounding. The distorted, overlapping limbs of Al-Atallah’s figures seem to externalise the deep internal contortions produced by the building-up of unsustainable emotional pressure. 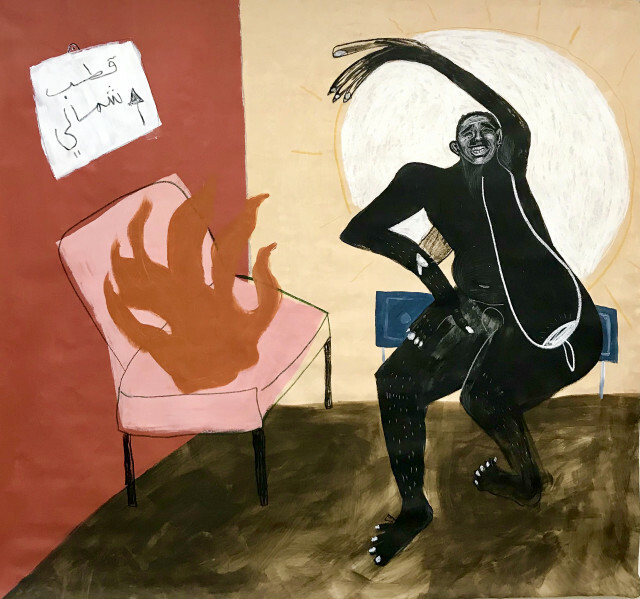 At the same time, they capture the performativity of the convulsive, expulsive dancing practised by East Africans captured and sold into the Arab slave trade in the Saudi Arabia of Al-Atallah’s birth. In a violent eruption of energy and feeling, this dancing brings the individual perilously close to loss of control. Yet as a restorative act of magical healing, its aim is to rebalance and fortify the soul and mind in a manner that parallels Aristotle’s idea of the catharsis (from the Greek word meaning ‘cleansing’ or ‘purging’) experienced by theatregoers in ancient Athens. Incorporating ink, acrylics and pastels, the paintings in Roadblocks apply the force of these traditions to the fraught experience of contemporary identity-formation. As composite self-portraits, Al-Atallah’s figures combine her own characteristics with those of others in whom she sees herself reflected, and who are in turn reflected in her own sense of self – capturing the subtle, perpetual mirroring processes that take place when one’s own identity emerges in concert with that of others, and by identifying with other people. Together, these works form a set of highly personal reflections on a childhood poised between cultures, identities and sexualities; of emotional and psychological tensions, and of their release through performance and creation. Al-Atallah, who now studies at the Royal College of Art, also works as an illustrator; recent commissions include cover art and t-shirts for Kanye West, and recent shows include BBZ BLK BK, an alternative graduate show organised by ten queer artists of colour at Copeland Gallery, Peckham earlier this year.